This is an updated route of the old Dragon's trail cycling from Guizhou provice to Guangxi. The tour starts from mountain areas around Guiyang and the trip is mainly on well-paved provincial road. This program mixes some adventure on countryroads in rual areas of China. Riders will be impressed by the ethenic groups and the unsophisticated culture there, living in hotels and local guesthouses, enjoy traditional food and lifestyle in the minority villages. Exploring the less travelled backroad routes around Guilin and Yangshuo and finish the tour with a highlight bamboo cruise and invigorating mountain bike cycling. The starting point of this tour is Leishan town, over 220km from Guiyang. If your flight arrives early in Guiyang in the morning or before noon on the first day, we will transferred guest directly to Kaili (transferring on expressway from Guiyang to Kaili first, and then on provincial road from Kaili to Leishan town), or we will arrive in Leishan town in the evening on first day. If your flight arrive Guiyang in the afternoon or evening on the first day, we will arrange some visiting of the Miao ethnic villages today, and finally we will arrive Leishan town for rest and bike testing before the tour starts. Stay overnight in Kaili or Leishan based on your flight arrival time. Leigong shan (Mountain road of Guizhou cycling routes, fond by riders worldwide). We start our cycling trip from the Leshan town, our fist day biking is also the most difficult one as riders will cycle uphill twice on long distant slopes along the Leigongshan mountain areas. Cycling uphill is tough and riders without determinations may easily get beaten by those mountain roads, however, if you follow some tips and keep your strength and be patient enough, nothing is difficult. Do follow our leaders and listen to their experience and tips, the cycling uphill might become easier. Total climbing distant today is about 20kms. Finally we arrive Yongle, a small and peaceful town in southern east of Guizhou province. We will stay overnight in the best guesthouse in the Yongle town. You might be attracted by this less commercialized village and the kind people there. Today we continue our cycling into the countryside areas, the valley, and the rice terraces, the ethnic minority of Miao, Yao, and Dong and their villages are with us. Riders have enough time to visit the local wooden houses and learn more about their unique traditional clothing as today’s cycling is mainly on a well-paved road. We do not have too much trouble from the traffic and the terrain as most of the cycling today will be on level of downhill except one big slope lasting about 10km, finally we finish our trail today in Rongjiang. It is an important county in the southeast of Guizhou. Stay overnight in the Dongxiangmi Grand Hotel, the best hotel of Rongjiang county helps us to restore our strength. Travelers may have chances to see the local Chinese market-day on weekend in rural areas. On the market fair, traders from surrounding villages come together and sell their own products like hand-made brooms, sickle blades, diverse fruits and spices. The market fair also is a perfect chance to meet people of different minorities. If our group is lucky enough to arrive in Rongjiang on Firday or Saturday, we may have time for a wandering and shopping in the market. During the cycling today, we will see the local farming, the Duliu River, the mother river of Local Miao people; their hard working pattern will surely impress you deeply. We will stay overnight in Congjiang hotel, a 3 star one. The most popular breakfasts in China are noodles, steamed buns, fried bread stick, soybean milk, or all kinks of rice noodles. The hand-chopped rice noodles in Guizhou are famous; we continue our cycling today after breakfast then surrounded by the impressive drum towers and Dong minority style bridges and buildings. The amazing Chinese architectures are sometimes a huge one but built without even a nail. The spectacular views of rice terraces come into our eyes during the trip today, the terrace fields looks like a dragon’s scales while the mountain roads are of a dragon’s shape. The road condition is good and we arrive at Zhaoxing in the afternoon, today’s lunch will be a simple roadside one. Zhaoxing is the biggest Dong village of the southeast areas in Guizhou, we will stay overnight and relax at the lovely Lulu guesthouse. We will stay one more day in Zhaoxing for rest to recover from the mountain climbing and prepare for the long distance cycling in the coming two days. Interesting Miao villages and things to do will be recommended by our tour guide. We will finish the cycling in Guizhou province and then enter Guangxi province today, congratulations! The dietary and accommodation condition in Guangxi is better than Guizhou, cyclists may feel comfortable physically and mentally as we may see the ‘most beautiful places in the heaven’ very soon!The distant today is over 100 kilometers but we will not encounter too much long distant slopes today, we will cycle along the river and then finally reach Sanjiang, the important county of Guilin area, a crossing connecting Guizhou, Guangxi and Hunan province. The night views of Sanjiang are awesome! The tower and theater shaped like a bird’s nest decorated by neon lights, the waterwheels, the rivers and bridges connecting the people and houses, Sanjiang is such a good place for traveling. Ping'an is the entrance village of the dragon’s backbone rice terrace scenic areas, the whole areas is pronounced Longji in Chinese.Most of the cycling today will be on level rating, however, many short slopes lasting tens of meters will accompany us. Ping‘an village is located outside the Longsheng county, we will have an inevitable cycling on the busy national road today, please follow the single line rules and do not get over speeding on those places where there are many annoying cars. The scenic area of the rice terraces is on the mountain and we may need to cycle up after arriving Heping village (the entrance village), more attentions are needed in this section due to the common travel cars and guests. We finally arrive at the world famous scenic spot. Today is a walking day for a break from the previous hard biking. The trekking lasts about 4hr on the mostly stone paved paths by the local villagers (walking shoes sound necessary). You will return in the afternoon and relax on the balcony while enjoying the sunset with a soothing cold drink.We will stay overnight at hotel or wood lodge on the rice terraces, local people lives in wooden house as it is warmer in winter. After enjoying the terraces, we are back on bikes today. After a major uphill riding at the 25th km, we will head downhill out of the mountains, to the reservoir. The local fish for dinner is recommended, or a fish head with noodles gives you a particular feeling? The route today covers about 30km on national road (with a bit heavy traffic) although we have tried best to avoid it. We are hoping staying overnight at a lodge at the reservoir brings you a new feeling. Today we will pay a short visit to the old village of Jiangtouzhou. This village is inhabited by a famous philosopher of the Song Dynasty, Zhou Dunyi (1017 – 1073). And their consistent attention to education has produced in history, many good officials. Old houses dating back to Ming and Qing dynasties are all over with intricate wood carvings and stone carvings. 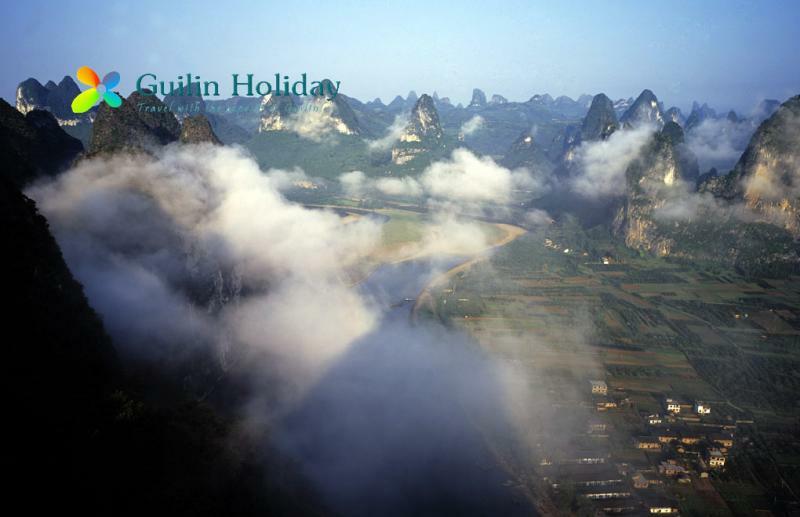 After the visit and trip, we will back to Guilin for rest, you will have enough time to visit some parks or relax on your own. Dinner is not included today, so try anything you like but do not take too much food with pepper. And try best to rest then stay in good shape. Overnight in Guilin city center hotel. We will start the Guilin section by cycling from the hotel and leaving Guilin from a less busy road. A section of off-road biking is included today. After some small paths and villages we will arrive at Huixian country, then continue our trip to the wetland banks and take a boat and start to enjoy the splendid scenic views. You may even climb the hill to see a complete picture of the wetland. After lunch and rest, we go on riding along the small path and villages to Yanshan town of Guilin and check in hotel for rest. If the group arrives at Yanshan town early, you can have an optional visit to the Garden show park of Yanshan, it’s optional and charged. Today the tour takes to enjoy the limestone peaks, crisscrossing rivers, old bridges and ancient routes connecting villages. The level biking is easy but the path crisscross the labyrinth of the small paths. Follow the leader closely. Cycling over the rice paddy fields. 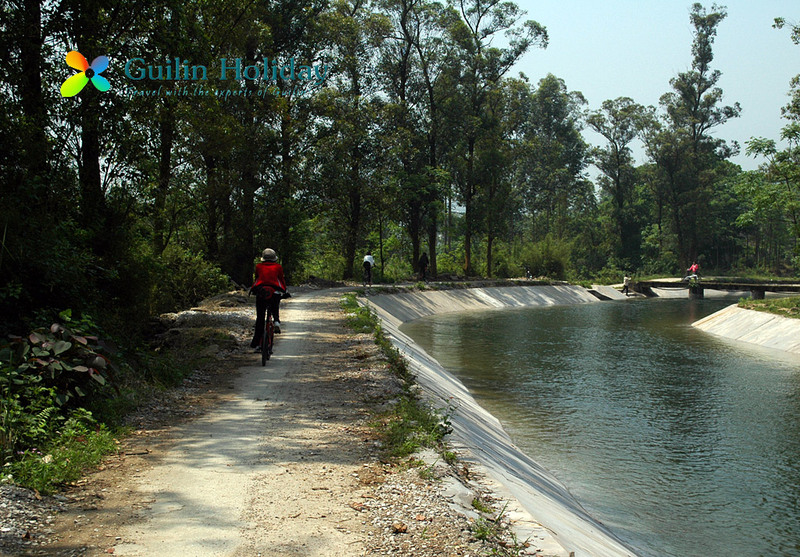 Except the 37miles biking today ends at Yanshan (totally around 4hours biking and 1-2hours for drifting on the Huixian wetland), you can also choose to have a bike visit to the Golden pheasant river reservoir at Luojin town. We may need to ride for a little longer distance. 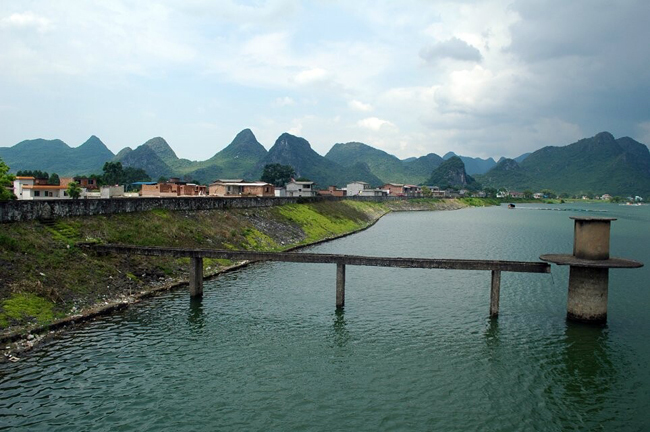 But the reservoir is the most beautiful one of Guilin. It is undeveloped, less polluted and for free. If your group is well equipped, efficient and skilled in biking, think about adding this reservoir into your route because this reservoir is even more beautiful than most of the charging places! Cycling to our undiscovered places in Guilin. During the biking today, you will see meandering rivers, limestone hills, rural countryside with rice paddies and mud brick houses. 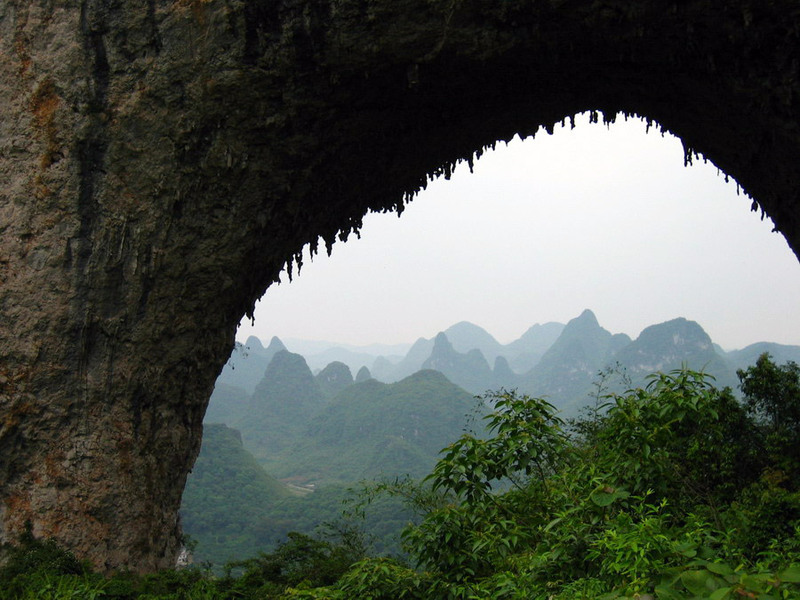 The amazing karst topography and peaceful country road accompany you all the way to Yangshuo. Our trip is quite different from the traditional tours by cars. The biking route today is not so simple, you will encounter macadam, unsurfaced forest-road with soil or even mud. For most of the time we will not have many chances to see groceries and our support vehicle, so do a cautious ride today. There are many elegant places worth to see. So enjoy the time on the road. We will arrive at Yangshuo before evening. We start our riding today along the Li River, biking through the lanes of peaceful villages, keeping away from the dangerous tunnels and roads for cars. 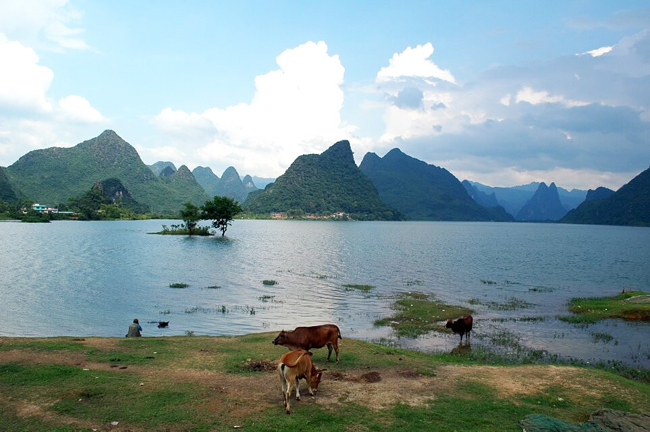 Enjoy a pleasant journey to Xingping, a small town located on the northeast of Yangshuo. 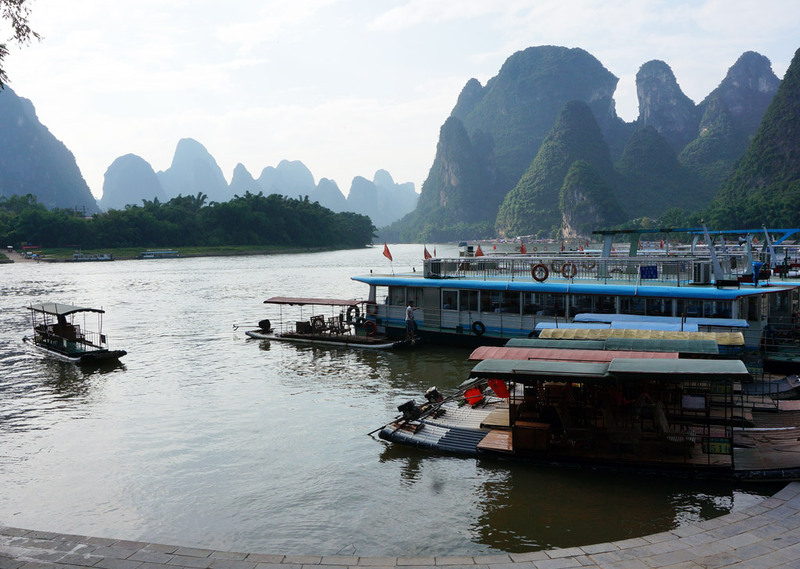 This beautiful place is an important wharf of the Li River. After checking in hotel at Xingping, you will have an optional choice to have a free time or go with the guide to climb the Laozhai Hill. On the top of the hill, a great panoramic view and the great bend of the Li River will definitely shock you! You need to climb over 1000 simple ladders before reaching the top of the hill. Look out for your own safety as it is a bit dangerous to walk on these wild ladders. We will take a bamboo raft cruise from Xingping to Yangdi and enjoy the most highlight sections of the Li River. 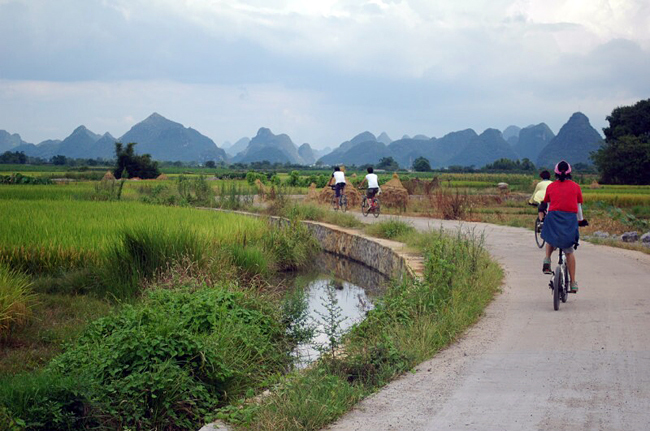 Then we continue our bicycle tour from Yangdi (the starting place of the well-known trekking rout of Li River). We choose country roads that close to the nature and also to avoid the pollution from the vehicle exhaust and regular travel groups. Choosing the 65KM/40miles today is recommended, as the bamboo cruise offers you a highlight of Li River and makes you comfortable and relaxed after the long trip. The differences between 65KM or 77KM route is based on the weather, road condition, and customer requests. 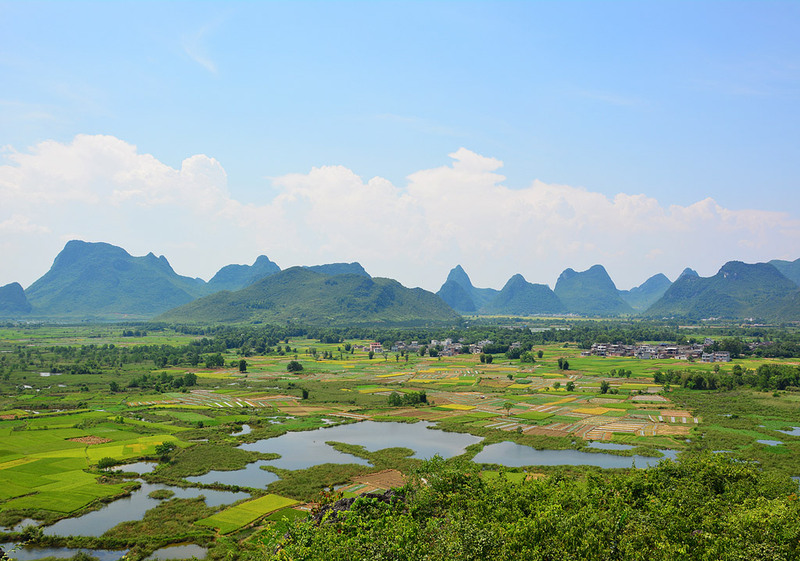 The 77km one is a cycling route from Xingping – Xitang – Daxu – Guilin on the east bank of Li River, while the 65km is a firstly bamboo rafting from Xingping to Yangdi and then cycling on the western side of the Li river until back to Guilin. 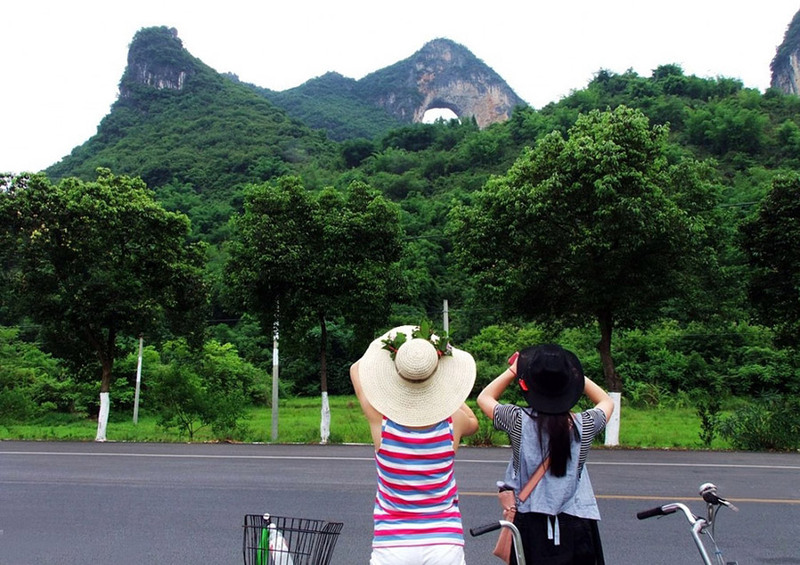 The 77km route is possibly affected a lot by the fast train station built in Xingping and the jammed traffic after the main national road's rebuilding between Guilin and Yangshuo (drivers and travel groups will choose this route to Yangshuo). All the bicycles will be returned to us after you checking in. We will have another feast of the local specialties to celebrate our great sucess! Overnight at a city center hotel. Welcome to our bike rental shop in Guilin at anytime! Please aware of that this is an unique cycling route for bicycle fans or anyone who wants to experience a complete cycling trip in China. Any time of the year based on your requests. 8. Any personally expenses and entry ticket price not mentioned in the itinerary. My husband & I are interested in the 18-day Landscape and Culture China Cycling Tour. Will this tour proceed in July 2018 if we book (we are two adult Australians) ? Please advise the full cost of this cycling tour?